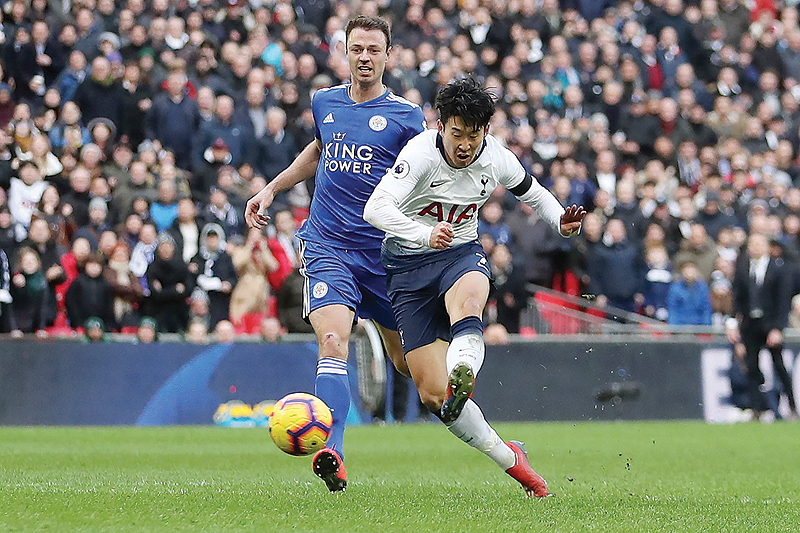 LONDON: Tottenham kept alive their bid to gate-crash the Premier League title race as Davinson Sanchez’s first goal for the club and Hugo Lloris’s penalty save inspired a 3-1 win over Leicester yesterday. The north Londoners are five points off the top of the table as they try to catch pace-setters Liverpool and Manchester City. While Tottenham are still outsiders to win their first English title since 1961, their ability to stay in contention, despite injuries to key players Harry Kane and Dele Alli suggests they shouldn’t be completely written off. This gritty success was the ideal preparation for hosting Borussia Dortmund in the Champions League last 16 first leg on Wednesday. Leicester have lost four of their last five league games, increasing the pressure on under-fire boss Claude Puel. With the Dortmund clash looming on Wednesday, Pochettino tweaked his team, leaving out Toby Alderweireld and Lucas Moura and recalling Fernando Llorente. 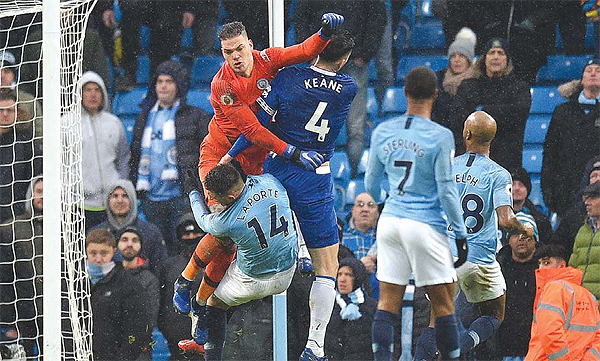 Llorente was caught napping early on when Harry Maguire evaded the Spanish striker’s marking and met James Maddison’s free-kick with a towering header that Hugo Lloris tipped over. That chance was symptomatic of a disjointed start from Tottenham. Leicester’s Harvey Barnes was allowed too much space in the penalty area as he raced onto Youri Tielemans’ pass, but a poor finish wasted a gilt-edged chance. Danny Rose’s surging run ended with a close-range effort that brought a good save from Kasper Schmeichel. Tottenham kept pressing and were rewarded with a well-worked 33rd minute opener. Trippier’s short corner found the unmarked Christian Eriksen and he whipped a pin-point cross towards Sanchez six yards from goal. Leicester called for offside, but their protests were in vain as Sanchez launched himself into a diving header that flashed past Schmeichel. Replays showed the Colombia defender was just onside as he scored his first goal for Tottenham since his 2017 move from Ajax. Demarai Gray should have done better than head Ricardo Pereira’s cross tamely at Lloris from 10 yards out soon after the interval. Leicester’s positive start to the second half brought a golden opportunity to equalise with their 60th minute penalty. A rapid exchange of passes opened up a chance for Maddison, prompting Jan Vertonghen to rashly bundle over the midfielder. Vardy had been warming up in preparation and was immediately introduced, jogging forward to take the ball from Maddison. But Lloris came to Tottenham’s rescue, plunging to his right to keep out Vardy’s spot-kick. Tottenham made the most of their escape as Eriksen doubled the lead three minutes later. Llorente pounced on Pereira’s poor clearance and teed up Eriksen for a superb strike from the edge of the area for his first goal since January 1.